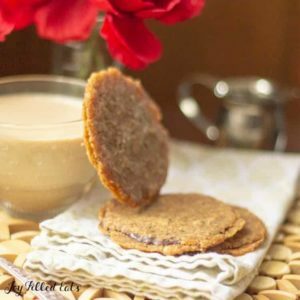 This Florentine Cookies Recipe is an easy but impressive treat to serve your guests or gift at the holidays. Wrapped up in cellophane and tied with a ribbon you can win over the pickiest gift recipient. I began this post over 2 years ago but never finished it. It just got buried behind other things and I forgot about it! What better time to share it now that the holiday season is beginning? The following little paragraph is as far as I got writing about Florentine Cookies the first time. Me, in May 2016: We had a baby sprinkle for one of my best friends this week. She is having her 6th baby any day! She loves florentine cookies so I spent a few hours the morning of the baby sprinkle trying to come up with a healthy recipe for them. The first two tries were total flops. The cookies didn’t spread out the way they are supposed to. I thought the third batch came out ok but still not good enough to serve at the sprinkle. After a couple days in the fridge, I tried them again. Now I loved them! I’m glad I didn’t throw out the little scrap of paper I wrote the recipe on. That baby is now over 2 and this Florentine Cookie Recipe is finally seeing the light of day! We moved this past summer so the photos of these cookies taken in my old house are making me feel a little nostalgic. We were there just until 10 years and celebrated 10 Christmases there. I remember my oldest son, then 3, now 12, going down to peek under the Christmas tree. (We had a hidden video camera and got this special moment on tape!) He walked slowly towards the tree, looked at the pile of presents, touched the fire truck that just had a bow on it, and suddenly it clicked. Santa came. He ran up the stairs as fast as could to tell us, screaming “Santa came!” over and over again. I’m getting teared up just remembering. 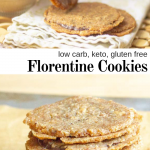 What is a Florentine Cookie? 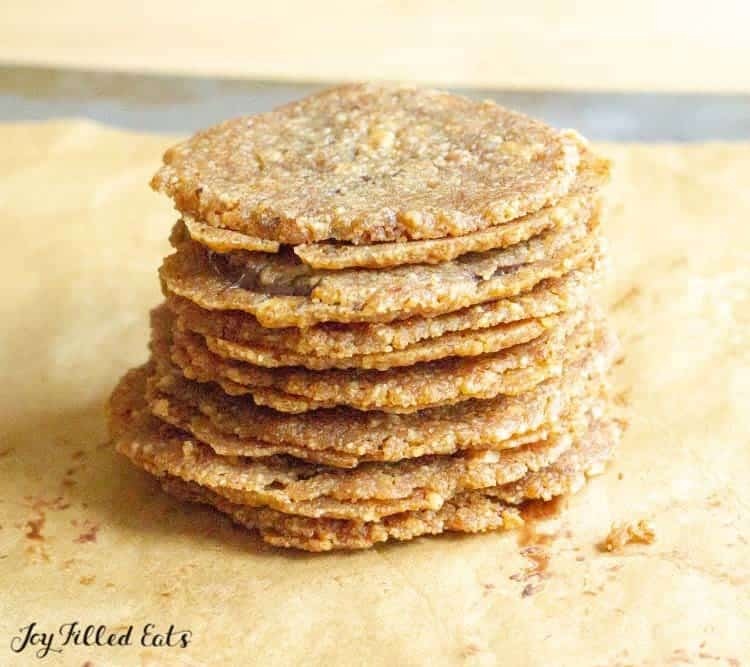 These have nuts but no dried fruit, honey, or sugar to keep them keto friendly. But, of course, I couldn’t skip the chocolate. 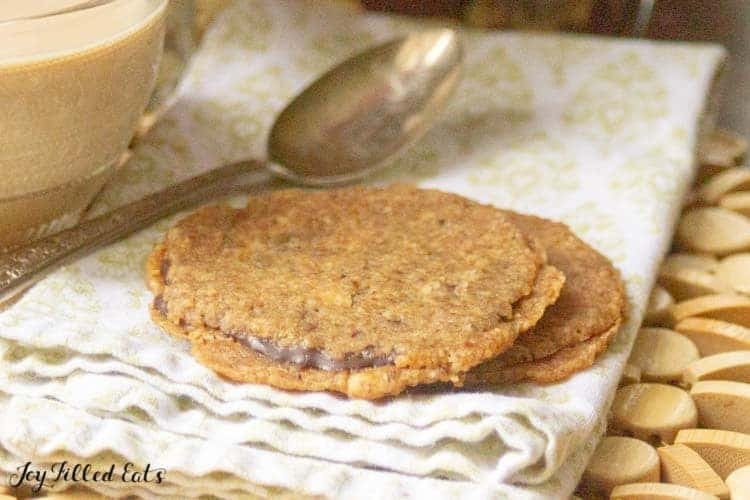 Since these are sandwich cookies they have a few more carbs than many of my other recipes. Each one is 2 generous sized cookies filled with sugar-free chocolate. If you are looking to reduce the carbs or calories simply drizzle them with chocolate and forget the sandwich step. They are delicious either way. 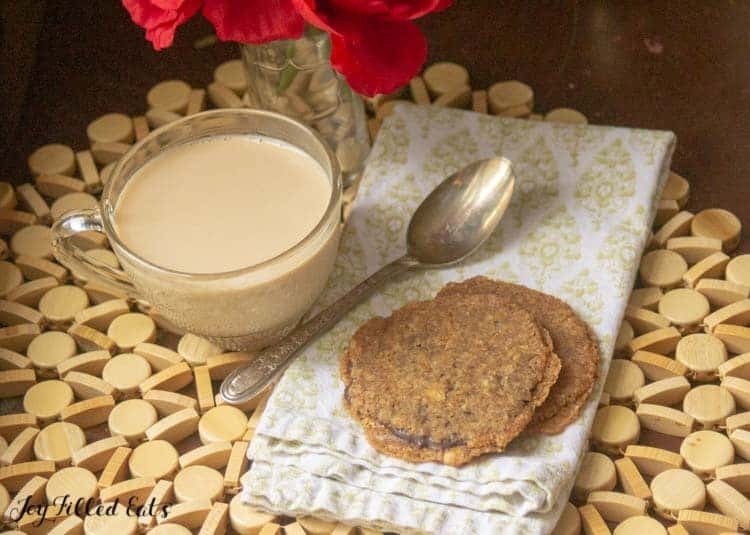 Looking for other healthy cookie recipes? Check out my Peanut Butter Cup Cookies, Butter Pecan Cookies, and Triple Chocolate Cookies! Combine the sweetener, butter, molasses, and cream in a small saucepan. Bring to a boil and boil for one minute. Remove from the heat and add the chopped almonds. Cool for 20 minutes. Preheat the oven to 350. Stir the gelatin into the cookie dough. 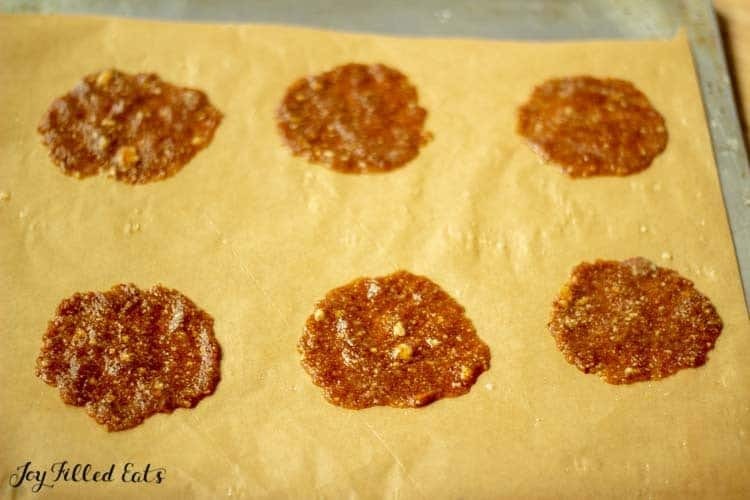 Drop rounded tablespoons onto the parchment-lined baking sheets, 8 cookies per tray. Spread the dough into thin circles. Bake for 10 minutes or until golden around the edges. Cool completely. Melt the chocolate in the microwave or on a double boiler. (I melt chocolate by microwaving for 30-second increments and stirring after each. When it is 75% melted just stir until the rest of the chocolate melts). Spread the bottom of one cookie with a little chocolate. Sandwich with another cookie. Store in the refrigerator. They are crisper after chilling. 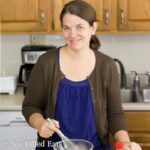 *** I get a lot of comments from my low carb readers on the use of molasses. I use it for flavor, not sweetness. One teaspoon of molasses has 5 grams of carbs. This recipe uses 1/2 tsp divided by 8 servings. That is less than 1 gram of carbs from the molasses. If you prefer you can just omit it. Hi Taryn. I am so excited to try this recipe but I bought almond flour instead of whole almonds. How much flour would I use? I'm not positive this will work with almond flour. I grind the almonds to a coarse texture, not smooth like almond flour. You can try using a little less. Using 1/2 cup of molasses would definitely make them spread too much. YAHSSSSSS!!! I've been craving these, and just knew there had to be a way. I am SO excited to try these! If they work out for me, they will make a perfect addition to our Christmas night cocktail party!! Hi, what is the purpose of the gelatin in the cookie? Just curious. Doesn't it make the cookie less crisp? Thanks! It acts as a binding agent since these do not have eggs. So excited to make these. I have been wishing for a low carb version!! If I’m reading the recipe correct it says use 1/2 tbsp molasses but in the notes it says use 1/2 tsp. Could you please clarify which measurement to use? Those look amazing and I love your recipes. Thank you so much for all the knowledge and hard work you do for us. 1/2 tsp. Sorry about the typo. I'm excited for a THM version of these! Thank you!! I just wanted to clarify, is it supposed to be ½ Tbsp of molasses as stated in the recipe, or ½ tsp as you mentioned in the note? 1/2 tsp. Sorry for the typo! Oh my goodness! I’m super excited for this recipe. I used to get these in Germany. They would come in a tube shape filled with hazelnut cream filling & & the ends dipped in chocolate. Do you think that these would be able to maybe be shaped around a wooden spoon once they come out of the oven? I think so. But they could also just fall apart... Lol. If you try please let me know! I’m always up for experimenting so I definitely will! I just made these today and they absolutely worked perfectly!! I let them cool slightly the rolled around the handle of a wooden spoon and let set up. I made some regular ones for my husband who used to go crazy for the ones from Trader Joes back in our carby days long ago. He was beyond delighted & satisfied. Thanks you so much for this recipe! Hooray! Did you take any pics of the rolled up cookies? I'd love to see one. Do you think pecans or walnuts would work? I have an almond allergy. Yes, any nut should work. Enjoy!